An audience gathers around the transparent 14-foot-long “culinary instrument” in a restaurant called Creator in San Francisco’s SoMa neighborhood. Brioche buns are sliced, buttered and toasted by paddles moving like waves in the ocean. They land in specially designed, compostable hamburger boxes. The buns are topped with fresh produce, sourced from local farms, which is sliced on the spot. Cheese is shredded from blocks and added. The in-machine meat grinder has been calibrated to vertically align the meat with diner’s incisors. The 4.5-ounce beef patties are ground from brisket and cooked using the induction method, both sides at once, then slid into the boxes. And the fumes from cooking? They are cleaned inside the machine. The sleek hamburger-producing machine, featuring organic curves and copper detail, fits in perfectly with Creator’s airy 2,200 square-foot space, white walls and high ceiling. It attracted a waitlist this summer for its bi-weekly lunches, and will open full time in September. It fits with the city as well — the restaurant is just two miles away from where the Elon Musk-founded OpenAI lab recently tested a robot hand named Dactyl. A Creator Burger fresh out of the robot that toasted the buns, sliced the produce, shredded the cheese, and cooked the beef. Creator’s parent company is a culinary robotics firm founded by 33-year-old Alex Vardakostas, who grew up in the burger business in Southern California. “I really got going on the griddle when I was like 14, 15,” says Vardakostas, whose family owns the two Orange County A’s Burgers locations. Since then, Vardakostas has focused on creating a healthier work environment and developing a better way to make high-quality food at a reasonable price. Four years after he had his bot-burger vision, he built his first hamburger-making robot in his childhood garage. “I would drive up to Menlo Park and get machine parts at TechShop and drive all the way back down to Orange County and hope they fit together and try to make it work,” he says. 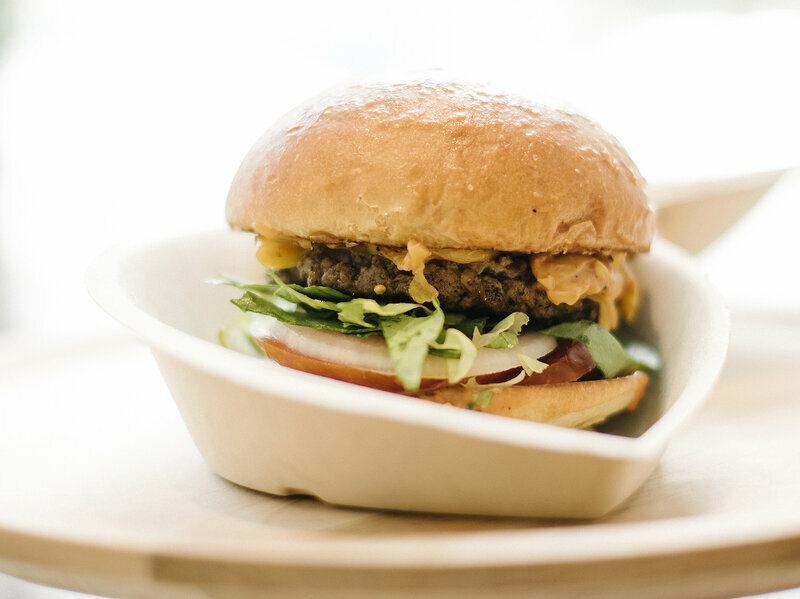 A move to San Francisco and a collaboration with 32-year-old Steve Frehn, now Creator’s co-founder and COO, led to the second rendition of the burger machine. Now on version four, the machine, comprised of food-safe plastic tubes and over 350 sensors run by software and 20 computers, is fully operational. It is stocked with carefully sourced produce, bread and meat. David Bordow, 32, culinary lead and experience designer, emphasizes the importance of quality and carefully chosen seasonal ingredients. “The philosophy is, ‘Let’s find the best stuff that is available,’ ” he says. The beef is antibiotic- and hormone-free, sourced from Country Natural Beef, a family ranch owned co-op. At Creator, there’s more to the staff than just a robot. All burger sides are human-made. The obligatory fries are on the menu, along with seasonal salads and vegetables. There are currently four kinds of burgers, including the Tumami, created by Top Chef‘s Tu David Phu, which features an oyster aioli and shiitake mushroom sauce. Eventually, customers will get to control how much sauce and seasonings they want the robot to add. “The nice thing about using a machine is that it’s very precise, so if someone has a sodium limit, or something like that, we can track that sort of thing and provide a little customization,” says Frehn. In a city of pricy boba drinks and marked up avocado toast, Vardakostas says Creator’s mission is to improve food quality and make it accessible. Burgers are $6. “We want everyone to be able to partake,” he says. For now, Creator is the only home to two burger-making robotic machines, although Frehn says they hope to expand. On the ground floor of the San Francisco building that’s also home to offices for Microsoft and Riverbed, approximately 10 Creator staffers worked the soft-launch lunch shift this summer. Employees, who start at $16 an hour, are allowed to spend 5 percent of their time on the clock reading or learning a new skill. Bookstore-style “staff picks” fill the three bookshelves, with titles including Alice Waters’ The Art of Simple Food and Michael Pollan’s The Omnivore’s Dilemma. Creator is not the only restaurant to feature a food-making robot while also making an effort to retain its humanity. Cafe X has three San Francisco locations. Each features a robotic coffee-making arm that can produce drinks in 30 to 40 seconds. Customers retrieve their beverages by punching in a texted code sent to their phone. While still in their early days, culinary robots are starting to pop up beyond San Francisco. In nearby Silicon Valley, Zume Pizza delivers pies pressed by a “Doughbot” in nine seconds. Across the pond in Paris, startup Ekim has created a three-armed robot that makes pizzas from start to finish. On the East Coast, four MIT grads opened Spyce in Boston in May, which features robotic tumbling woks that create customized bowls, under the culinary direction of renowned French chef and restaurateur Daniel Boulud.